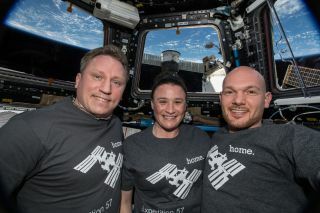 Astronauts Sergey Prokopyev of Roscosmos, Serena Auñón-Chancellor of NASA and Alexander Gerst of the European Space Agency are currently living aboard the International Space Station. It turns out that when you tell astronauts that a psychologist has been using linguistic analysis tools on tweets sent from space, they get a little sensitive. "That concerns me, as I'm a test pilot and math major," Randy Bresnik, NASA astronaut and assistant to the chief of the astronaut office, said jokingly. So far at least, Bresnik's own tweets haven't gone under the microscope, but researchers really are taking to Twitter hoping to pick up subtle linguistic cues they can use to understand how space travel affects astronauts psychologically. Specifically, Ahmadian and her colleagues scanned 13 astronauts' tweets for words that conveyed positive or negative emotions and those that referred to friends and family. Then, they looked for changes over time as they followed those astronauts through launch preparation, their visit to the International Space Station, and their first six months back on Earth. Bresnick started tweeting when he got assigned to his space station flight because he thought it would be a good way to share his experience on the orbiting laboratory with those of us on the ground. He said it took some time to get used to Twitter and its unique constraints. "It's like learning another — a shorter language — but adding another language to the many skills: OK, you've got your Twitter language," he said. Ahmadian said the research, which she presented on Oct. 1 at the International Astronautical Congress held in Bremen, Germany, is still preliminary. Thirteen astronauts aren't all that many, and there are plenty of ways to fool the analytics program, for example by referring to friends by name rather than by using a general noun the program can recognize. But she still thinks that the trends the team is noticing are intriguing. She says they see a decrease in social terms while astronauts are in space and an increase in positive emotion words after they return. That makes some sense, former NASA astronaut Mike Massimino, who was the first astronaut to compose tweets from space (although at the time they had to be emailed to Earth and posted by the ground crew), told Space.com. Robonaut, a NASA robot formerly in residence aboard the space station, has also tweeted from space. Ahmadian says studying astronaut tweets and photographs isn't just a matter of curiosity: They may be important to consider when space agencies look beyond near Earth orbit, when home is farther away and astronauts are gone for longer. They won't even be able to see the blue marble out their window. "How is that going to affect them?" Ahmadian said. "Maybe a lot of these positive emotions is coming from the fact that you can see Earth, it's right there, you can see how beautiful it is." And the isolation Ahmadian sees in astronaut tweets will likely only worsen as well as space voyages lengthen. "Even if we take the most well-adjusted individuals and put them in space, we are putting them in a situation that is very different from anything that we could capture on Earth, even with analog environments," Ahmadian said. "Clearly, it's not just about selecting the best people, it's also about looking at what could happen up there and also looking at the positive impact that going into space has; I think that's something that has been completely ignored." Both Bresnik and Massimino consider it their job back on Earth to share their own life-changing experiences in space, they said. But maybe not by overthinking their 280-character messages. "Some people come up with a lot of really important statements and try to change the world," Massimino said. "That requires too much thinking for me."